Coffee Caramel Chip Ice Cream. I just love making my own ice cream. The ice cream maker pays for itself in just a few batches. Organic, gluten free and dairy free ice cream at the store costs a fortune! With homemade, I get to control the ingredients, and I can come up with delicious flavors like this coffee caramel ice cream. If you loved my 3 ingredient coffee popsicles, then you will love this new ice cream! One of the best things about this coffee caramel ice cream is that there is no added sugar. That’s right. 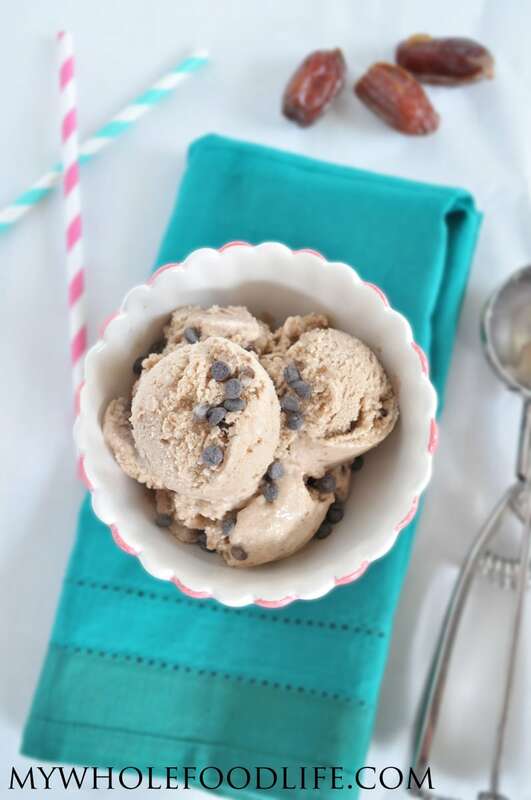 This ice cream recipe is only sweetened with dates! I used my pecan caramel ice cream as inspiration for this recipe. This ice cream is vegan, gluten free and paleo. Another great thing you can do with this recipe is to make a magic shell using this recipe. It's like a frozen caramel macchiato. Yum! Soak the dates for at least 30 minutes in enough water to cover them. I soaked mine on the counter top. Once the dates are soaked, add them to a blender with a tiny amount of water and blend into a caramel paste. In an ice cream bowl, add the coconut milk and coffee and mix well. Turn on the ice cream machine. It should take about 15-20 minutes to make ice cream. When the ice cream looks like it has about 5 minutes left, slowly add the caramel and help guide the ice cream while it churns so it gets mixed well. If you are adding chocolate chips, now would be a good time to add them as well. **Please make sure your ice cream bowl has been in the freezer at least 18 hours before making this ice cream. The ice cream will be a soft serve consistency. If you like a harder ice cream, you can place it in the freezer for another hour before eating. I like to store mine in this tub . If you don't have an ice cream maker , you can always make this into popsicles. I like these molds and these push pops . I can't wait to try this recipe, but I need more dates so I have to wait till my shipment arrives next week! Sounds delicious. I am making the coffee ice cream tonight! Already have my coffee brewed and ready to go. A while back you asked what flavors were wanted to see & this is pretty close to what I requested (tiramisu with a caramel ribbon)...THANKS! I can not wait to try it. I have family coming & we always make ice cream when they are here...now the tough post is deciding which flavor to do first!! We may just have to do a different one every night that they are here because you have offered up so many delicious options...you rock! I just got myself the Cuisinart Ice Cream Maker and have made one batch already (strawberry with dairy cream) and I just tried making the above recipe, which sounds so yummy. I didn't use reduced fat coconut cream but what happened is that it became icy and chunky when I added the creamed dates near the end. The dates weren't blending in so I used a spatula to incorporate it - this one doesn't have a nice consistency - what did I do to mess it up? Did you use coconut cream and not coconut milk? The recipe calls for coconut milk. Just finished my batch and it was delicious! I put it in the freezer for a bit because I like it a little more firm. This tasted just like an old favorite of mine from Baskin Robbins , Jamocha Almond Fudge! Your recipes always rock, but this one is a new high. Thanks for what you do. I did use coconut milk (my mistake saying cream) but perhaps I needed to blend the coffee and coconut milk together more thoroughly before putting it in the Cuisinart at the beginning. When adding the mushy dates later on , will it all incorporate itself or do I need to mix it in with a spatula? Others are getting great results so I'd really love to know how to do it properly cause the flavours are so yummy. Thanks! I just made this tonight. After reading the one comment about it tasting like jamocha almond fudge flavor from Baskin Robbins I had to try it! I do agree - it is an excellent flavor. However, I had trouble with my coconut milk - when I opened the can the top inch or two had solidified and the rest was liquid. I attempted to stir it and make it smooth, however, I did not have much success with it. I was hopeful that the ice cream maker would mix it but it did not. What is the secret to getting the coconut milk smooth so that you end up with a smooth mixture? I ended up putting the whole thing in the blender and we had yummy shakes but even at that there were still little chunks of the coconut milk still solidified. What do you suggest? Whenever I open a can it's like that, I just whip it in the blender for a minute and it smooths out all the chunks. I'm slowly being convinced to get myself an ice cream maker...I see so many incredible recipes like this one and you are so right in saying that dairy free ice creams are so pricey at the store! Guess its worth the investment! I have a question about the Cuisinart Ice Cream Maker. When I use mine, the mix gets very hard around the bowl, but stays runny in the middle. You say it will be the consistency of soft serve, mine never is, I have to chip the hard part out of the bowl, pour the liquid in and put it in the freezer. Seems to defeat the purpose of the machine! Am I doing something wrong or is there a problem with the ice cream maker? A very thin layer of ice builds up on the side, but the ice cream does get to a soft serve consistency for me. Are you putting it together correctly? I just had the same issue. I saved the mix and threw it in the fridge until I can get my ice cream barrel back and useable. Now I have 12 pureed dates that I'd like to make into something. Any ideas? I'm sorry that happened. :( I didn't have an issue with that. Hi Melissa, I have 2 cans of coconut milk (not light) One says 12% fat and the other 20% fat. I made your recipe using the coconut milk With 12% fat and found it to be icy texture once frozen and small chunks of frozen coconut fat in the ice cream. I loved the taste and would like to try making it again using the other can. Do you think the same thing will happen? What percent of fat was in your can of coconut milk? I honestly don't remember the fat percentage. The coconut milk I link in the post is the exact one I used if that helps any. It's not the lite coconut milk it's the regular one in the can. Hi Melissa, the link was very helpful. Thank you for pointing that out. The can you used has 22% fat and I made mine using 12%. Which may be the reason mine had an icy consistency. I will try it with the other can i have (20%f) and see what happens. I'll keep you posted. Thanks again!,! Is there a way to make this without an ice cream machine? I don't have one, but this recipe sounds incredible! I am not sure. You might be able to blend and freeze in ice cube trays. Then blend again once frozen? It would take a lot longer to do that though.